Can a person who is illiterate write a book of law? Definitely not. He cannot write. How can a person who does not know what law is write a book on it? What would you say if you saw an illiterate person introduced a legal system, let alone writing a book on law? And what would you say if there were completely original decrees in this system and if it did not imitate any system? You would definitely be astonished. What if you saw that this legal system introduced by that illiterate person was not only a theoretical system but also a system applied by communities and countries and that ensured justice fully when it was applied? It is such a system that when even the wildest communities adopt this system as a guide, they catch up with the most civilized communities and even overtake them. Not a small disorder and a minor loss of right occur in the communities managed by this system. People’s safety of life and property are ensured fully. That is, in the communities where this system works, a cat becomes friends with a bird and a hornless sheep can take its right from the horned sheep. Is it possible for such a system to be introduced by an illiterate person? It is definitely not possible. Let alone an illiterate person, even if you brought one thousand professors of law, they would not be able to do it. What they did is apparent. They only cause chaos. Let us add another property to this system: It is such a system that it does not get old as time passes. That is, an illiterate person introduces a legal system today and even people living one thousand years later become happy by applying that legal system. It is known that laws have a natural lifespan. They die just like people when their lifespan ends. However, the system introduced by this person does not die. You probably think we are telling a tale. This would not happen even in tales. However, we are not telling a tale; we are telling you about what Hz. Muhammad (pbuh) did. Listen carefully now. Hz. Muhammad (pbuh) did not know how to read and write. As the Quran puts it, he did not write even one letter nor did he read a single word. However, he introduced such a legal system called shari’ah that it administered fourteen centuries and one-fourth of the people in each century with justice. There is nothing similar to it on the earth. We see with our own eyes that laws made by jurists that studied law for years cannot live even for 3 to 5 years and get old. In addition, they cannot manage people with justice. Is it possible for this illiterate person to make these laws on his own and is it possible for these laws to administer fourteen centuries and one-fourth of the people in each century with justice without undergoing any change? Who can regard it possible? You will say this person made this legal system on his own. When you accept it, you will have to explain how. That is you need to explain how a person who cannot read and write do something like that. Or, you will say this person receives revelation; he is the Messenger of Allah; Allah taught him this system and informed him through revelation. This person is not the owner of this system; he is only the conveyor of it. Which one of the two alternatives do you choose and accept? Of course, there is no way but to choose the second one. Shebol, the leader of Law Congress 1927, states the following: Humanity takes pride in Hz. Muhammad since he is a human being. For, he introduced so laws and principles thirteen centuries ago though he was illiterate that we, Europeans, would be the happiest generations if we reached his value and truth two thousand years later. Prince Bismarck states the following: Scrutinizing heavenly books, which are said to be sent by Allah to manage people in various eras, I could have seen no wisdom and accuracy, since they had been distorted. Those laws are not eligible to ensure happiness of society, even not a family. However, Muslims’ Quran is free from this description. I scrutinized the Quran in every aspect. I observed the great wisdom in each word of it. German poet and author, Johann Wolfgang von Goethe states the following: Nobody can take a step better than Hz. Muhammad’s principles. Despite all the success that has come the way of Europe, all the laws and principles decreed by Europe are insufficient in relation to Islamic culture. We, the nations of Europe, in spite of all the opportunities our civilization is impregnated with, are still only on the first step of the ladder on whose final step Muhammad stands. Noah Feldman, who is a professor of law at Harvard University states the following: In fact, for most of its history, Islamic law offered the most liberal and humane legal principles available anywhere in the world… Shari’ah also prohibits special favors in court. It demands equal treatment for rich and poor; it even condemns the vigilante-style honor killings that still occur in some Middle Eastern countries… Besides, the phrase “we want shari’ah” used by the people who protest the palace in the Ottoman State means we want justice. George Bernard Shaw, the Irish dramatist, socialist, thinker and one of the prominent dramatists of the twentieth century, states the following: We need the prophet Hz. Muhammad more than ever in a time when the problems of man heaped up and became insolvable. If he was alive, he would solve all of these problems with an easiness of drinking a cup of coffee. 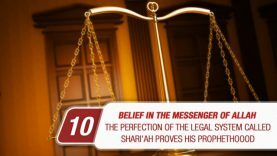 We can understand the trueness of the Islamic legal system from the following fact: The Muslims advanced based on their degree of adherence to shari’ah and regressed based on their degree of moving away from shari’ah. We also want you not to overlook the following point: A discovery regarded as wonderful two centuries ago is regarded as ordinary today. That is a discovery that astonished people two centuries ago and made the person discovering it famous would be discovered even by a child today if it had not been discovered then. For instance, the discovery that the world is round, which made Galileo famous, had not been made at that time and remained secret up to now, it would be discovered by a small child. If a child who is keen on astronomy could travel in history and meet Galileo, he could have taught Galileo many things that he did not know. The reason why we mention this rule is as follows: It is a mistake to look at that age from this age in order to see how extraordinary for a human being the system introduced by Hz. Muhammad (pbuh) is. We need to go thirteen centuries back and isolate ourselves from the knowledge and skills given to us by this age. We need to live in the Arabian Peninsula, where people buried their daughters alive. Then, we need to watch the activities this person did. We will see that an illiterate and inexperienced person who was not helped by time and space established such a system and justice on his own and that happiness in the world and the hereafter is attained through it. After seeing this, you will state the following if you are fair: A human being cannot establish such a system and justice on his own with his own intelligent and skills. Such activities cannot be done by a person alone even in this age, let alone in that age. This proves that these decrees, which ensure justice and order, do not belong to him. He only conveys and teaches those decrees to people. These decrees come directly from Allah; they are His orders and prohibitions. He only conveys and teaches those decrees to people.